This is the image that perhaps I have worked the hardest for. 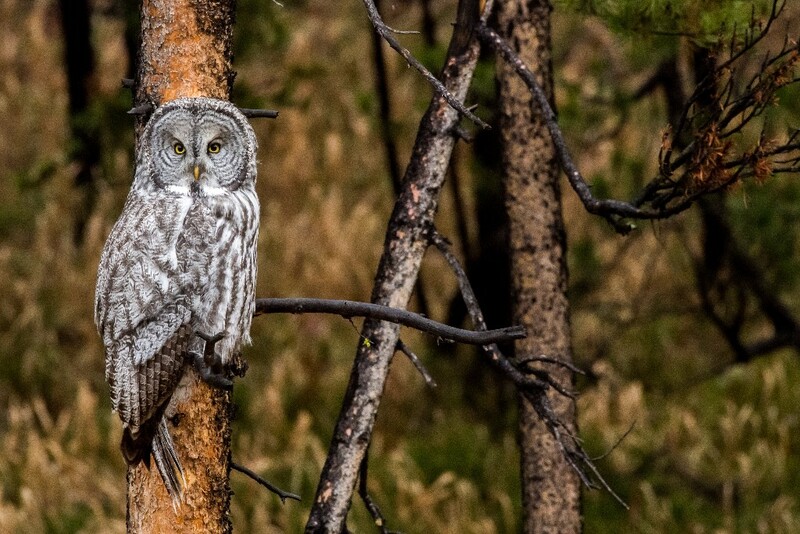 I left my bed at about 4:00 am that morning to drive to an area of Yellowstone where Great Gray Owls are known to be found. When I got there I saw her far in the distance on a limb of a tree. I accepted that it was going to take a long time to gain her trust and I patiently waited. She left and came back, getting a bit closer but still very far off. At about 2:00 pm she decided to come closer and gift me with the experience of a lifetime. 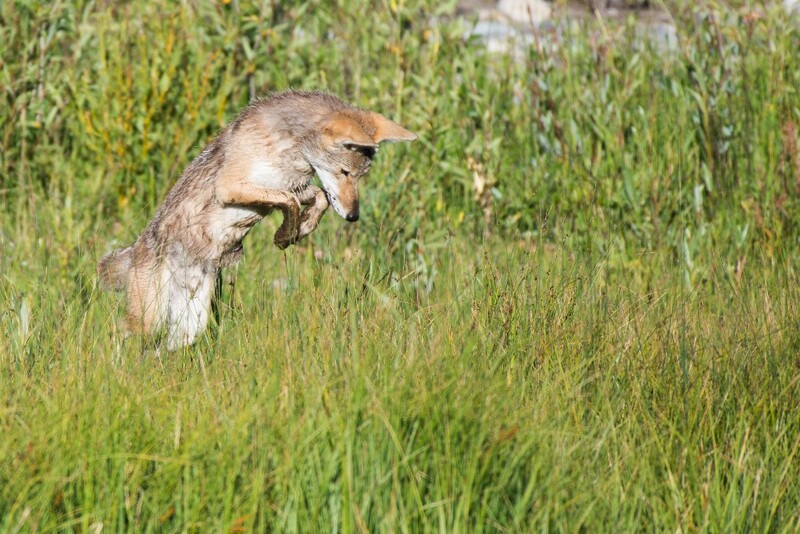 In a meadow by the creek this coyote leapt acrobatically in the air attempting to pin his breakfast. Notice his muddy paws and wet skin from hunting in and around the creek. 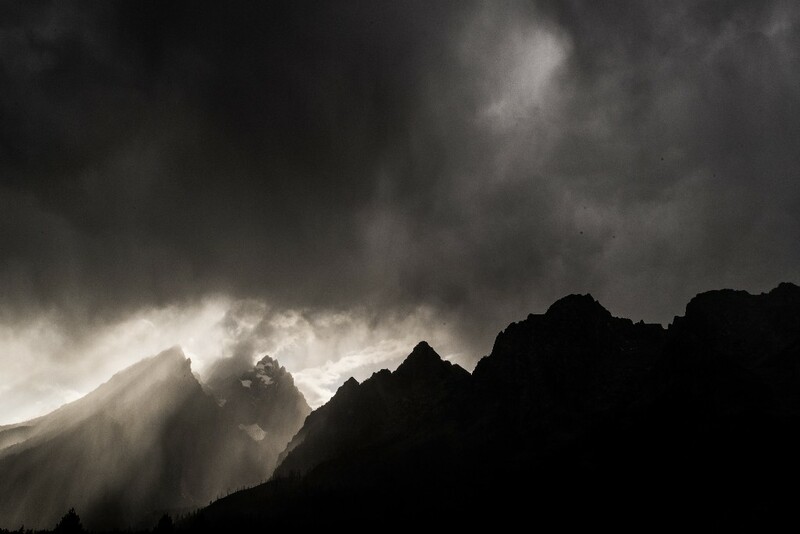 The rhythm of the summer is ruled by evening storms that create instances of dramatic lighting. Believe it or not, this is photograph was shot in color, not black and white. As summer turns to autumn the animals also find a new rhythm. 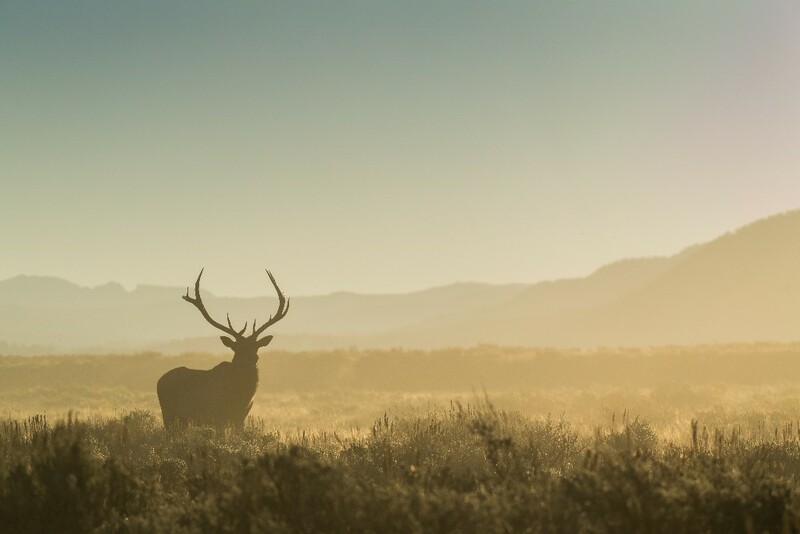 Standing proud in the morning light, this bull Elk chased away any would-be challengers and protected his harem. On some days, the right amount of cloud cover lies in just the right spot and the mountains glow purple for about 30 seconds. 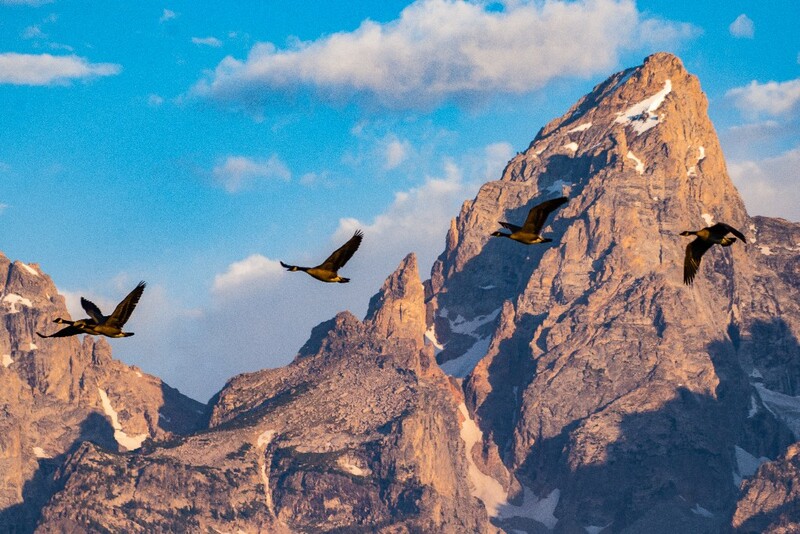 The sun rises with incredible speed to greet the inhabitants of Grand Teton Park. The Greater Yellowstone ecosystem is rhythmically alive. As the days become shorter and colder the aspens and cottonwoods begin to turn yellow. Soon their leaves drop for the winter as they wait for spring to start over again. Bison are some of the best adapted animals of the Greater Yellowstone Ecosystem. Instead of migrating, like many other species, they grow thick coats and dig for grass all winter in the snow covered fields. I spent a few days with this elk herd, visiting their grazing grounds every morning. 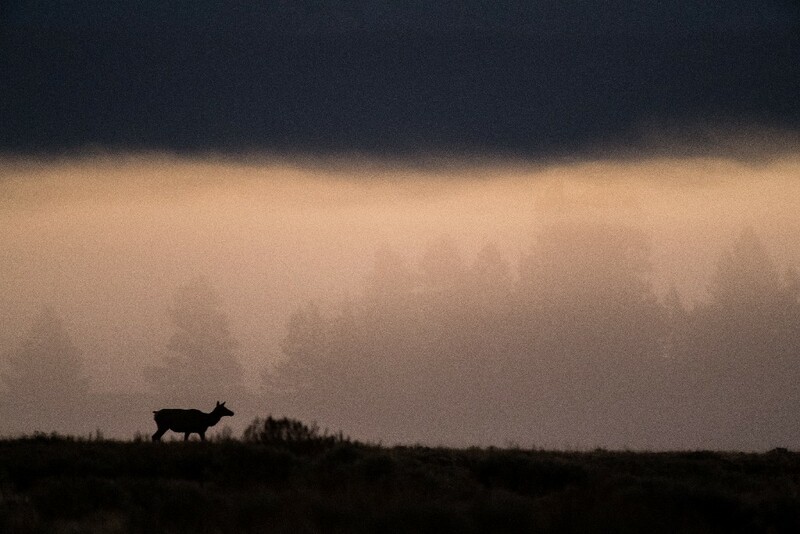 As the fog burned off that morning a faint outline of this cow elk emerged from the mist. I spent two hours admiring and studying every move this owl made. Clouds turned into snow and she perched from tree to tree. For those two hours time seemed to stop and rush at the same time. We shared the first snowfall of the season and at the end of the day we went our separate ways. The experience changed me for the rest of my life, and she, unaware, continued on in the forest. 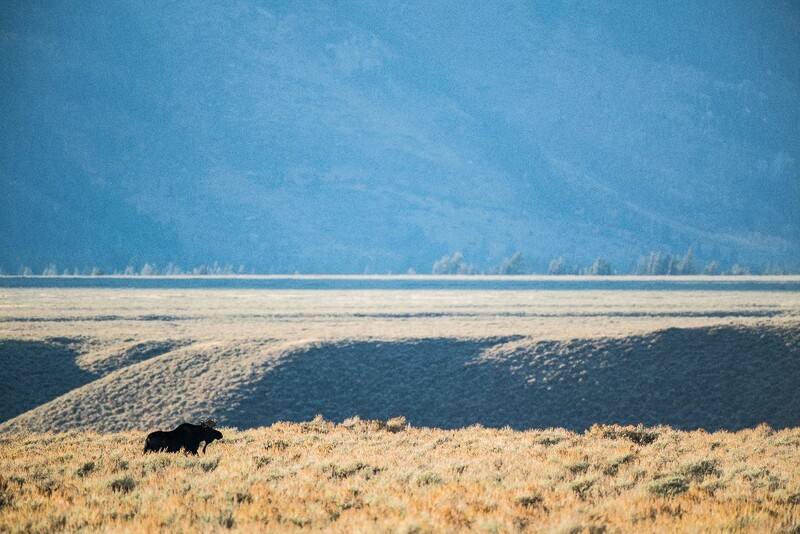 I traveled for about 5 miles with this bull moose until he dipped into the Snake River canyon for a drink and continued on his journey, wandering through the sagebrush seeking a mate. As a conservation photographer I always try to be in tune with the sounds and rhythms of the land. One morning while hanging out with Old Man Coyote, I heard the geese in the distance. A few minutes later they crossed in front of the Grand Teton, beginning their journey south for the winter. 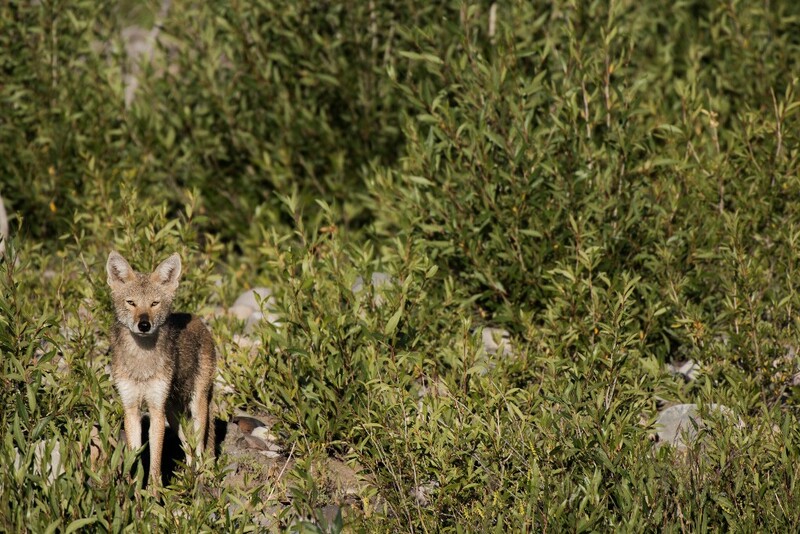 Coyotes are some of my favorite animals to photograph because of their rich personalities and wisdom. This coyote kept an eye on me, making sure I was paying as much attention as he was. The Grand Tetons reach a height of over 13,000 feet guarding the valley below. 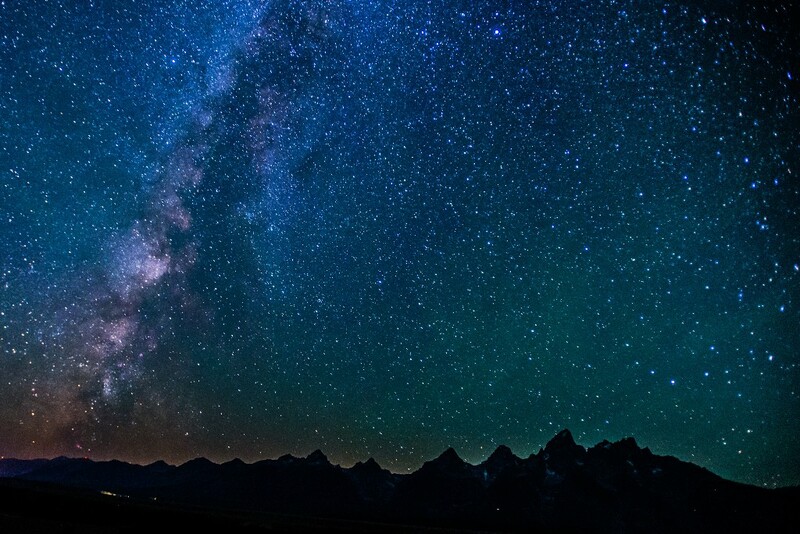 The valley is immense but dwarfed by the Milky Way galaxy. This throws the relative size of spaceship Earth into perspective. 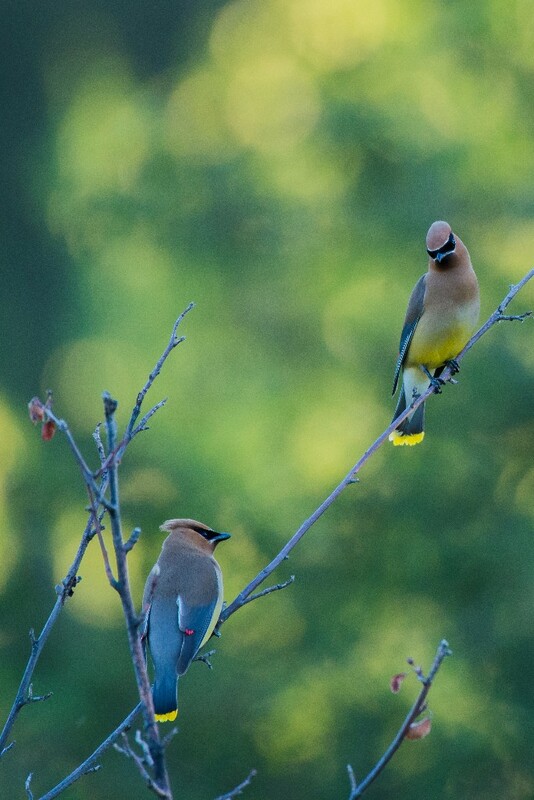 Cedar wax wings get their name from the red tip at edge of their wings. They travel together in large flocks can sometimes pick a tree clean of fruit in an afternoon. At some point in the history of our species, humans began to think of themselves separate from nature. 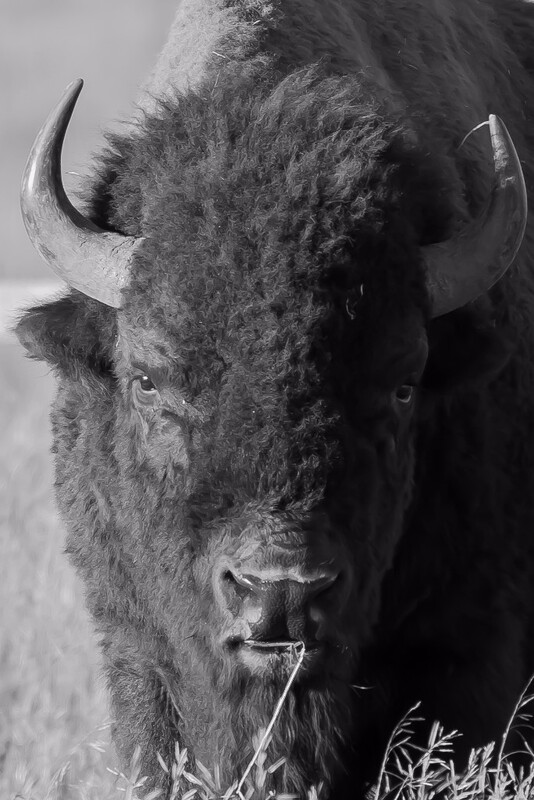 In the process of that separation many of us lost our ability to relate not only to our fellow species, the bison, the coyote, the eagle, but also with the water, the mountains, and the trees. Our individual lives are microcosms of that history. We grow up talking to trees and visiting with birds, with a constant sense of mystery and curiosity. For some strange reason we change along the way; after all, only crazy people talk to trees right? Nevertheless, that sense of mystery still lives hidden within all of us waiting to reawaken. You need not travel far to rekindle it; your local pond and the trees on your street are full of wonder. There are, however, a few places in the world imbued with supernatural beauty and mystique. In the U.S., the National Parks have allowed me to more deeply revive my relationship with the natural world. As a conservation photographer, my connection with the environment happens through the lens of a camera and a process known as “slow-photography.” This process is not novel or unique in today’s world, but it is quite rare. I begin with research, and learn about habitat preferences, mating behaviors, and favorite hunting grounds. Finally, I look for those specific places in the parks. Once in the field, the word “slow” takes on a whole new meaning. I spend hours and sometimes days connecting with and becoming part of the environment. Although I try to camouflage myself, the animals always know that I am there. The more time I spend becoming part of the place, the more comfortable they are sharing their home. Perhaps this is best illustrated by the story behind the images of Old Man Coyote. 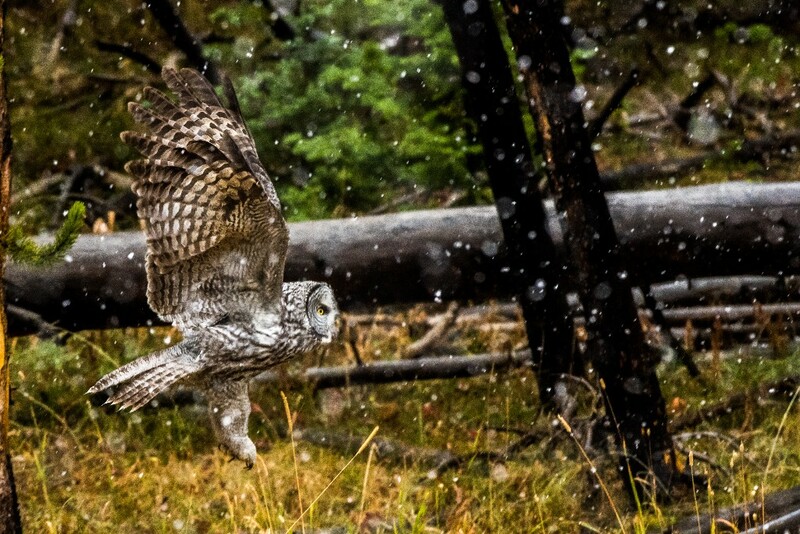 Schwabaucher Landing in Grand Teton National Park is one of the most popular places to photograph. Resident beavers dam the creek and in the early morning when the ponds are perfectly still, the Grand Tetons reflect in the perfect mirror of the water. I spent some time there this past summer, and one morning as I waited for the sun to rise I spotted a coyote emerge from the forest into a small meadow by the creek. I hung out with him for a few hours while he hunted for chipmunks and mice, eventually retreating into the forest for the rest of the day. Because he acknowledged me and continued to hunt, I felt confident that I was not disturbing him. I decided to return for a third morning. He emerged from the forest once again, gazed at me, and went about his business as usual. Until then, I had not been able to capture an image that exemplified his elegance and power, but that morning was different. He leaped into the air over and over, pouncing on his prey until he caught breakfast. I am extremely passionate about the ethics of wildlife photography. I believe that as a photographer I should never interfere with the natural behavior of the wildlife or do anything that puts their life in danger. What happened next illustrates the contrasting attitudes towards wildlife and slow-photography. Later that same day, a man claiming to be a wildlife photographer asked if I had found anything to photograph that morning. I quickly pointed to the coyote and proceeded to recount my last three days. He spent maybe fifteen minutes watching before he became frustrated that the coyote was not looking in our direction. He began to call and whistle at him. Sure enough Old Man Coyote turned to look at us but quickly ran into the forest. The man left and that was the last time I saw Old Man Coyote. Because wildlife photography is so focused on the natural world, it is easy to forget that behind every photo is a person interacting with the landscape and its inhabitants. For that reason, we must think carefully about how we as photographers connect with the environment. The relationship between the photographer and subject can be extractive or mutually beneficial. In the case of the former, we take: we allow a quick photo to replace our own lived experience, and we capture photos without respect for the species that gave the image to us. In the case of the latter, a mutually beneficial exchange, we give and receive. We take the photo, but with respect for the wildlife we work with. As Professor Robin Kimmerer wrote, how can we move towards ecological and cultural sustainability if we can’t imagine what a mutually beneficial relationship feels like? On an individual level, photography is one of my passions, but it is also my career and it provides for my life’s needs. These images are a gift of nature. As such, it is my duty to respect and reciprocate that gift by enabling the relationship to continue. This brings me to the societal level: The images and stories we bring back into our cities, which are backed by a slow and intensive process of research and patience, allow people to connect personally with species and landscapes they may never see themselves. In doing so, the photos garner support for protecting species and habitats. As a conservation photographer it is my hope that the images I share with the world enrich our relationship with the environment, and help people connect more deeply with the natural world. Chema is a wildlife photographer and drone cinematographer with a passion for sharing the wonder of the natural world. He believes that nature photography is not only a fine art, but a powerful storytelling tool. It is his hope that the images he shares connect people to nature in a way that raises awareness and inspires people to take action to protect and conserve the natural world.